I went to an event for Cherilyn Eagar last night. She is running on the Republican platform for U. S. Senate against incumbent Bob Bennett. I had a chance to meet Joe Wurzelbacher. He was very nice, and gave a great speech. 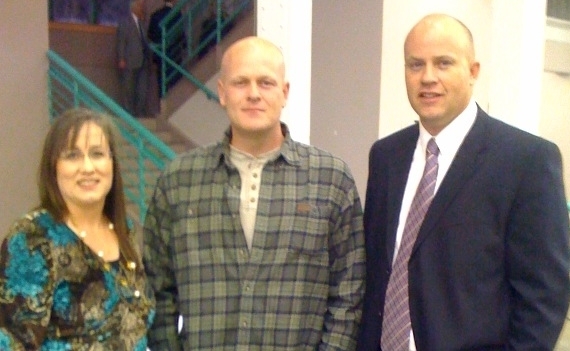 Before he spoke, my husband and I had a chance to speak with him for about 20 minutes. We talked a lot about plumbing. I think he feels like many of us. He said being famous isn’t fun, and he would rather be plumbing. While he enjoys going on the road and meeting people, and spreading the word about taking our country back, he, like many of us, wants to do the things in life that we do well. We want to do things that bring us joy, happiness, and peace in our lives. We love spending time with family, with friends, and being productive. So does he. Now we are thrown into a political maelstrom and feel we can no longer watch as the political winds blow the country into a place that is unrecognizable. The question isn’t whether or not we want to be politically active, the question is, “How can we not be?” It is our responsibility as good Americans, parents, and citizens of this great nation to join in the great debate. To put our best foot forward and leave behind some of our current desires for something so vital to our nation’s well-being. This may be the only chance in our lifetime to begin to repair the damage. Remember, this isn’t about the Democrats. This isn’t about Barack Obama. This is about the slide into socialism and the Federal Government’s take over of our lives that has been happening for over 100 years. Do you think we’ll get through this like we did the Carter years? Think again. This is a different time in history. Take a look at The 4th Turning Cycle of History. This is the time when a fight for the right way of life happens every single time in history. 300 generations have done it the same way. We are no different. But the last two times we went through this cycle, we did a poor job of it. 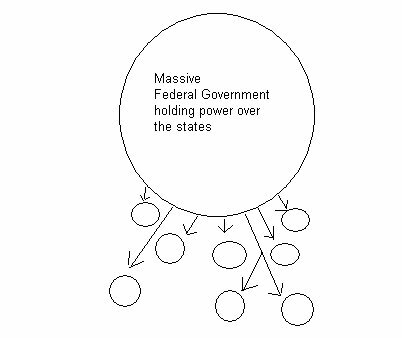 Here is a drawing of how our government was set up to look originally. 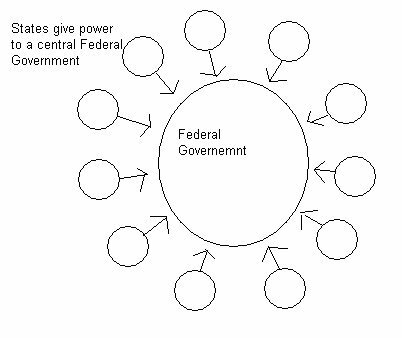 This shows a central Federal government, with surrounding states giving them certain limited powers. This was in the Founding of this great country. After the Civil war, we created another founding. Many people don’t realize how much our government system changed. But here is a drawing of that founding. 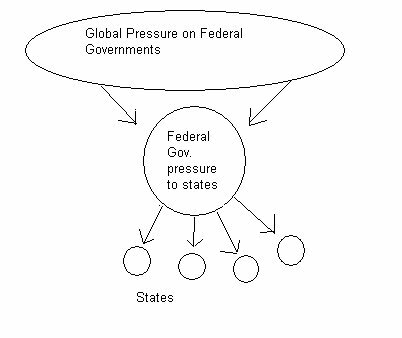 You will noticed that now the Federal government is over the states, and the arrows are going from the Federal government to the states. The Federal government is now telling the states what they can and can’t do. State sovereignty was being eliminated. Then after the great depression, which was the crisis of that turning in history, we began WWII. This pulled us from our depression, and another new founding was created. This founding has been the most dangerous of all. This globalism and socialism has found their way deeper into our government, where personal responsibility and accountability (as Joe spoke of in his speech last night) have all but disappeared. Here is a drawing of that founding. Notice the global entities that are putting pressure on the world governments, and then those governments are putting pressure on their states. The states are left with a desire to de-centralize. We can go one of two ways at this point. We can move to global governance and lose all sovereignty, or we can bring the power back to the states, and re-gain control of our sovereignty on a local level. The EU has had such an impact on Europe, that they no longer have currency that belongs to their individual countries but a European currency. The global pressure on the U.S.S.R. had the opposite impact. The states of that country broke apart and became their own individual countries. So here we are, facing another crisis. I have no mis-conceptions that this will be an easy time in history. I’m not even sure what this crisis will really look like, but we are beginning to feel the impact. We have had a housing bubble burst. We have had the dollar falling. We have had a swine flu scare. We have the threat of terrorism ever looming in the back of our minds. And we have The White House full of people with a different world view than many Americans. What are you doing? Anything? Are you just turning off the news because, why watch it anymore? I know you are frustrated. I am too. So is Joe. This will be a long fight. This is not an election-cycle away from being fixed. We will need to transform ourselves into the kind of people that generations later will thank us for our sacrifice. Help us Save The American Republic. That’s what this group is all about. And every tiny chapter all over is doing the same thing. We are waking our neighbors and friends and we are standing together. Is there a 9-12 group in your area? Join it. If there isn’t one, create one. Call it The STAR Forum, and we’ll help you. There are amazing people behind the scenes doing so much. But we need your help. We need every tiny community all across this great nation to become STARS. We hold the light and truth within us. Together, we can Save The American Republic. No one can do this alone. A giant group won’t do it either. But each community doing something can change the world. Each person putting his shoulder to the wheel can push the Constitution back into the forefront of our minds. We can talk about it. We can study it. We can be proud of it again. Politics must be talked about openly. Religion, too, for that matter. They aren’t subjects to be considered controversial anymore. They are the fabric of our country. What we must also do, is be active. Next year the Republicans want to take back control of the Senate. If we are just looking for Republicans, then count me out. However, if we are looking for truly Constitutionally-minded Republicans, I’m in. Once we find them, how do we beat the machine that is the Republican incumbent that hasn’t held to those principles? We become delegates in our precinct and take back our party. We the people, create the party. We have just ignored it for far too long.